You’ve seen them showing up in stores and in our reviews now for more than a year – cordless finish nailers. 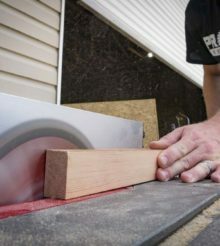 There’s been a lot of hype, but we’ve all fallen prey to spending our hard earned money on something that sounds too good to be true and we definitely don’t want to get burned when it comes to tools so critical to our business. So if you’re wondering what the deal is with pneumatic vs cordless nailers, here’s a detailed look at what to expect. Cordless nailers come with a bit of a sticker shock compared to their pneumatic cousins. A cordless nailer like Porter-Cable’s 20V Max 18 Gauge Brad Nailer comes in with a bare tool price of $149 compared to $70 for a similar pneumatic. Neither tool can run by itself. The cordless model will run $199 with a 1.5 amp hour battery. Toss in good compressor like one from Rolair along with hoses and fittings and your cost of entry is well over double the cordless nailer. The other cost consideration is that most Pros don’t live on one nailer alone. Adding a narrow crown stapler and larger finish nailer, like a 16 gauge, are par for the course. Looking at Ridgid’s HyperDrive nailers, the 16-gauge will run you another $249 without a battery and charger. Go with Milwaukee’s lineup and you will pay $329 – $349 for the bare tools and $349 – $399 for kits. Realistically, you’re going to want at least one of them to come with a battery if you don’t have other batteries from the same platform already in your arsenal. On the other hand, you can pick up the pneumatics for around half the price or less. In this debate, the ergonomics are much less about the design of the handle and rubber overmold. The first consideration is weight, which is easily in favor of the pneumatic models. Even when you consider the weight of the hose that is hanging down, there’s a big difference between a finish nailer weighing around 2 pounds and a battery-powered model that can push the 7-pound mark. It doesn’t end with weight though. With a cordless nailer, you’re not dragging around a hose at all. You’re not tripping over it, it’s not throwing off the balance of the nailer while you work at various heights and angles, and you’re not tethered to a specified length. There’s also no compressor noise in the background. If you’re working in an area where people are home or working, this is a major bonus. Testing several nailers, I enjoyed flawless performance. While neither will be jam-free forever, proper maintenance will keep them firing effectively. Where you’ll notice a difference is in the firing cycle. Pneumatics fire as soon as the trigger is pulled like you’d expect. Cordless models like the ones found in Ryobi’s line take a moment to spin up before firing. Milwaukee and Hitachi have both solved this puzzle, however there have been heat buildup issues documented. This has only been shown to happen at a firing rate no trim carpenter would ever maintain to deliver Pro results though. Considering the run time of both types of nailer almost seems unfair – the pneumatic nailer will run until your power goes out or you suffer the consequences of using too small a compressor and have to wait for it to recharge. The lowest run time cordless nailers will still get you more than 400 shots on one charge with a compact battery. Some nailers are capable of firing more than 1600 shots on a single charge. Where things get interesting is when the nailer stops. For the cordless model, you swap batteries and put the used one on a charger. Even using compact batteries, it’s unlikely you’ll outwork two batteries being cycled. When the pneumatic stops, you’ve typically got to figure out if it’s an issue with the power, compressor, or hose. That’s time consuming and potentially expensive. It’s also much less common compared to the frequency you’ll need to charge batteries. The pneumatic nailer is a simpler design than the cordless nailer. However, there are more pieces tied together in the pneumatic. You have to ensure that your hose isn’t leaking, the couplers are solid, the compressor is running properly, a power source is available, and you have to remember to oil your nailer every day along with keeping track of some compressors’ oil levels. Those considerations are null and void with the cordless nailers currently on the market as long as you have a couple of batteries to work with. While maintenance is generally easy with pneumatics, there are more pieces in the chain that have the potential to fail if not properly maintained and require at least occasional inspection. Just for fun, I decided to time how long it takes to get my gear from the truck until I fire the first shot. It takes two trips with the pneumatic combo – one for the compressor and a second for the nailer, and hose. Of course there’s materials and such, but that happens with the cordless nailers as well. By the time I got the gear, found a plug, connected the hose and nailer, and got the compressor up to operating pressure, I was more than 6 minutes in. My cordless nailer? 30 seconds. When you add in hiking through to the back of a house or going upstairs, the time begins to pile on. As you move through your work day, you’ll find that you also have to move your compressor and gear. At the end of the day, it’s going to take the same two trips to get your pneumatic gear back to the truck – you’ll just be more tired. With a couple of room changes, going with a cordless nailer system can easily save you 30 minutes and even more the more you move. So should you go cordless or stick to the traditional pneumatic way of doing things? If you can afford it – both. If you’ve got a large room or entire house to trim out, it can absolutely be worth it from a cost and ergonomic standpoint to bring in the pneumatic solution. Punch list work and small jobs will be even faster with cordless models. They both have their place and I’m not ready to say that either one can displace the other completely. What do you think? Let us know by shouting out on Facebook, Instagram, and Twitter! Any differences / concerns from a safety standpoint? Is eye protection a must or best practice? Thanks! What about using a simple hammer ? takes me 3 seconds to grab it,and 5 sec to finish it. I don’t know why, but I can’t get a cordless to shoot an 18ga nail through baltic birch plywood. It always leaves the nail with about a 1/4 to 1/2 inch to go. This leads me to wonder, what else can’t I shoot it through? Do I really want to find out the hard way? Until they are more reliable, I won’t risk ruining my workpiece. For simple wood working, its tough to beat a cordless 18ga brad nailer to tack things together. I know I would be lost without mine.